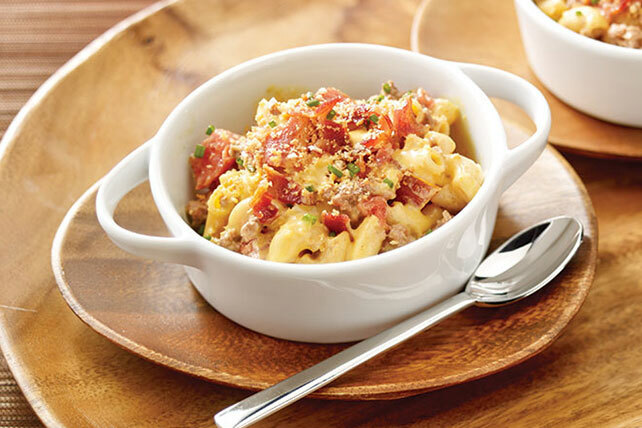 When it comes to good, old-fashioned comfort food, it just doesn't get any better than cheeseburger mac and cheese. Unless, of course, you add bacon. Cook Macaroni in large saucepan as directed on package. Meanwhile, brown ground beef in large skillet; drain. Drain macaroni. Do not return macaroni to saucepan; set aside. Melt butter in same saucepan on medium heat. Whisk in flour; cook and stir 1 min. Gradually stir in milk; cook 1 to 2 min. or until thickened, stirring constantly. Add Cheese Sauce, noodles, ground beef and tomatoes; mix well. Cook 2 min. or until heated through, stirring frequently. Spoon macaroni mixture into serving bowl; top with bacon, bread crumbs and chives.